Your first thought when you notice your engine starts overheating is probably to blame the weather, and for the most part, you’d be right. But the hot weather isn’t the only reason why your engine’s temperature can rise and overheat. By learning some of the other reasons why your engine is overheating you’ll be able to identify the problem and deal with it sooner. Don’t get caught stranded in the middle of a July afternoon, prevent it with knowledge. 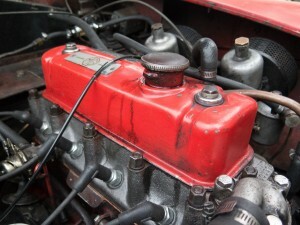 But just in case it does happen to you, you should also know what to do in case of an overheated engine. North American Wholesale brings you some of the most common reasons why your engine can overheat. Your car requires several fluids to function, including the coolant. The most common reason why your engine can overheat is because you’re running low on coolant. The coolant or antifreeze travels through the cooling system removing the heat from the engine. If your engine overheats, the first thing you should check is the coolant level. Be sure to wait a little while until the engine has cooled off. You don’t want to burn yourself. Refill your coolant tank with AMSOIL’s Dominator® Coolant Boost, and you’re good to go. A low oil level can hurt your car in different ways. From higher fuel consumption to an overheated engine. Oil also works as a coolant. It’s actually responsible for up to 40 percent of the engine’s cooling. Many metal pieces in the engine work together to complete the combustion process. As these pieces rub together friction occurs, which in turn raises the engine’s temperature. Coolant isn’t enough to keep the temperature down. You need oil too. Check your oil level and if you need fresh oil, get a synthetic oil change. Listen to your vehicle when it tells you it’s time to get new oil. Changing your oil, just like replacing several filters, should be part of your car’s summer maintenance. So if you’re looking for the best synthetic oil, get AMSOIL Synthetic Oil. Try their XL 5W-20 Synthetic Motor Oil if you want to extend your oil change intervals. You can browse through their whole line of synthetic lubricants at their online store. You can also call North American Wholesale at (866) 580-1008 to get some AMSOIL Synthetic Oil recommendations and place your order. If for some reason the coolant can’t reach the radiator, it won’t be capable of diffusing the heat and the engine will most likely overheat. Over time, the radiator fluid can solidify and clog the radiator, blocking the coolant’s path. You need to do a full radiator flush once a year to keep it clean. Radiator blockage, however, can also occur from the outside. As bugs, dirt, and debris stick to it they prevent the air from passing through. This is really easy to remedy. You can use your garden hose to remove those obstructions. Another common radiator issue, that’s much easier to fix, is a loose radiator cap. If the cap isn’t shut tightly, the water in the engine can start bubbling up, causing steam to come out from under the hood. If you see smoke coming out, you need to park your car and wait for the engine to cool down enough so you can replenish the lost water and close the radiator cap. It’s also possible that a radiator leak might be the reason why your engine is overheating. Radiator leaks cause the coolant levels to drop and the engine temperature to rise. Save yourself some trouble and some money by finding and fixing the hole when it’s still small. It might take a while for you to notice there’s a leak in the radiator since small leaks only drip a little bit of coolant at a time. An AMSOIL Synthetic Oil Change can help you regulate your engine’s temperature this summer. Give your car the best possible engine lubrication and start reducing your oil expenses and frequent oil changes, which in turn will help you reduce your environmental impact. You can get your AMSOIL Synthetic Oil online or by calling North American Wholesale at (866) 580-1008.